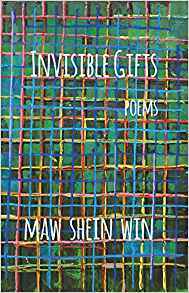 Invisible Gifts: Poems, by Maw Shein Win, Manic D Press, San Francisco, 2018, 96 pages, $14.95 paperback. Post-Romantics…work in an impersonal melancholic style. What is central…is the relation between memory and the past: the clash between the possibility of remembering, of going on, and the lure of oblivion. Myanmar (Burmese: [mjəmà]), officially the Republic of the Union of Myanmar and also known as Burma, is a sovereign state in Southeast Asia…For most of its independent years, the country has been engrossed in rampant ethnic strife and its myriad ethnic groups have been involved in one of the world's longest-running ongoing civil wars. During this time, the United Nations and several other organisations have reported consistent and systematic human rights violations in the country. A "GLITTERING PALACE" MAY be a place or a mind—or a book. Maw Shein Win's phrase, "ruins of a glittering palace" (my emphasis) might refer as well to the sorrows of the ancient country of her ancestry. That the reference is multiple and not specifically tied down is typical of this book. The casual reader—the one who does not know or does not look up the book's references—might not notice how extraordinarily strange the book is. One proof of its oddity is that it contains what is probably the only English-language (or any language) poem in which the author takes on the thorny persona of the notorious fruit, durian. I am the lonely king. Ruler of all, both sick and sweet. and crawl. Tremble and crawl. One might ask why a Burmese-American woman might find her identity in the notorious, loved-hated durian fruit. If one is Burmese in the ethnic-fearing USA, is one "like" durian: lonely, but, in one's imagination, a king, trusting no one? This is one of the many questions raised but not answered in this remarkable, deeply enigmatic book. What does it mean to write a sentence like "Summer brought flowers this fall" (my emphasis)? Or "he is a braided girl"? Or "Thunder is the underside of a walrus." Or "Blood dust. Stock lust. Lapdogs. Silicone and eyelets"? How are these things related to one another? The book has references to Guan Yin, the Bodhisattva of Compassion, and even to the Buddha: "Why do we pain?/ Only the Buddha knows." Surely suffering, a sense of life's unreality, and samsara—referenced throughout the book as a movie, life as a movie, a film with "close ups" and "long shots"—are deep chords in this book. Issues of cisgender and transgender are also raised: "The Farm Without Name" deals with the great collaborative photographers Claude Cahun and Suzanne Malherbe, whose work moved among multiple identities, deliberately undermined authority (including Nazi authority), and flagrantly manifested the impossibility of definitively separating one gender from another. Of Cahun, David Bowie remarked, "You could call her transgressive or you could call her a cross dressing Man Ray with surrealist tendencies." Win's poem on Cahun and Malherbe contains three stanzas: the first consists of sentences beginning with "she"; the second consists of sentences beginning with "he"; the third begins with "it." The book is, however, not exactly "experimental"—at least not as the notion of "experimental" is usually understood: no L=A=N=G=U=A=G=E poetry here, though there is a great deal of attention paid to sentences (as in Ron Silliman and Lyn Hejinian) and to the sounds of words and verbal play: "Capes flung on the floor. Caps/ hung on the door./ Naples, Nutbread, Noontide, Nightcaps…wild capes and caps, captivated." There are also color references throughout—green, pink, and silver, for example—but the primary color reference is to "blue," a word we find repeated constantly throughout the book. Is it meant to suggest the Virgin Mary—the Western "equivalent" to Guan Yin—or the "blues" or even what Southerners call "haint blue"? We don't know, but the word is constantly in evidence, adding something—what?—to the texture of the book, one of whose sections is called "Blue Bells." (In the poem in which the titling phrase appears, they are flowers, "Bluebells," not "Blue Bells.") The book is "filled" with what Win doesn't know or doesn't do: "The mountain I didn't climb"; "Maps of countries that don't exist anymore"; "This is what I remember or rather this is what I don't remember." Yet almost everything in the book takes place, as in a movie, in the present tense: the tense that insists that something is going on right now. The magnolia tree is a blanket. The blanket is a flamingo. The flamingo is a beach mat. The beach mat is a soldier. The soldier is a tangerine. The tangerine is a villa. The villa is a pony. near an abandoned tool shed. Samsara is perhaps indicated here in the sense of the theory of rebirth and cyclicality of all life, matter, existence: "The magnolia tree is a blanket./ The blanket is a flamingo." Indeed, the concluding poem of the book is an elegy for the poet's sister, who died in 2016. Entirely in the present tense, the poem consists of four haiku, each separated from the others by a single word: down, long, round, close. Cycles. But the book is filled with an immense number of utterly disparate elements—as different from each other as the magnolia tree is from the blanket, the flamingo and the pony or "thunder" from "the underside of a walrus." These elements are not—cannot be—"unified" but they can be presented. The verb "is" in the above passage is not so much an assertion of identity as it is a kind of plus sign—something that allows these disparate, unconnected elements to appear together in the gossamer structure of a sentence, and only there. They are not "the same"—not "is" in that sense: they simply stand together as part of a grammatical structure. Gertrude Stein's Tender Buttons is perhaps somewhere behind this technique: "Rhubarb is Susan." But Win's book is no imitation; it contains a number of things (like durian) not found in Stein or anyplace else. 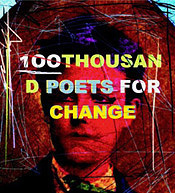 The presence of so many lists also suggests a choral element in the author's consciousness, and these poems might benefit by some sort of choral presentation in which both separateness and connection are asserted. The animating energy of these poems is perception. But one has to be careful. The perception may bend to the surreal, may become a fiction or a riddle. From the title poem: "Choose the dog collar./ Feathers dangling from the bell./ Mix beef bones and lemon peels./ Watch fat curl into fire./ Pick up cactus bloom.…"
The definite, clear nature of the perception is a mask for the enigma it conjures. These poems bring us into an area of clear cloud: they tease us into and out of thought. They express a constant desire to know, but that very desire is a mask of the unknown or the unknowable. They are brilliant and in this world. But they are also constantly escaping the world. The tension they create is fascinating, hypnotic and fulminating all at once. They touch us in the way that the genuine always touches us: giving us something we need but telling us that there is always more, always something "else." Literature, writes the great Turkish writer Elif Shafak, is "a transcendental journey into other lives, other possibilities… [It] has to take us beyond. If it cannot take us there, it is not good literature." Invisible Gifts is a wonderful guidebook to the beyond, to the world as passionate, mind-opening enigma. 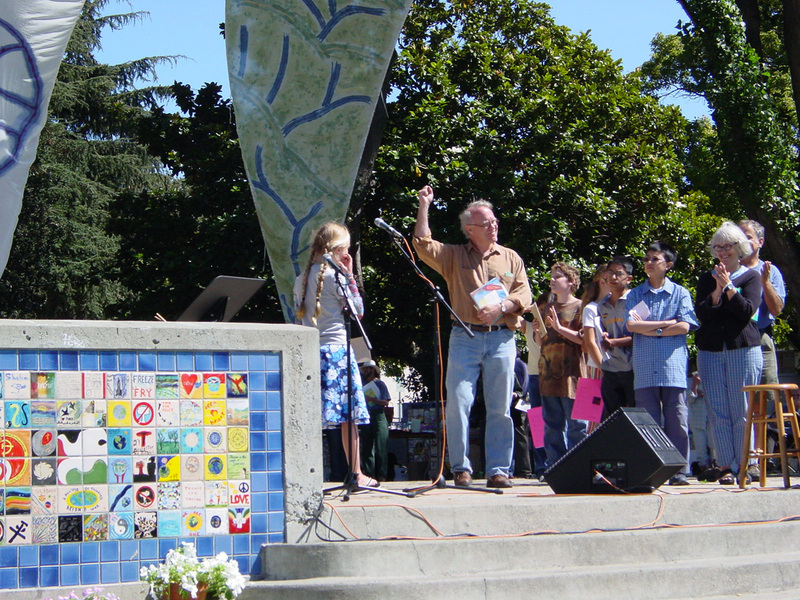 Jack Foley is a poet, critic, and host of KPFA FM's "Cover to Cover" book show. His most recent books are Riverrun, poetry, and The Tiger and Other Tales, fiction. He is a Poetry Flash contributing editor.